Older homes have often been through many changes over the years. Some of those changes are both necessary and important. Other changes affect the architectural aesthetic of the home and were most often done as a way to avoid routine maintenance. 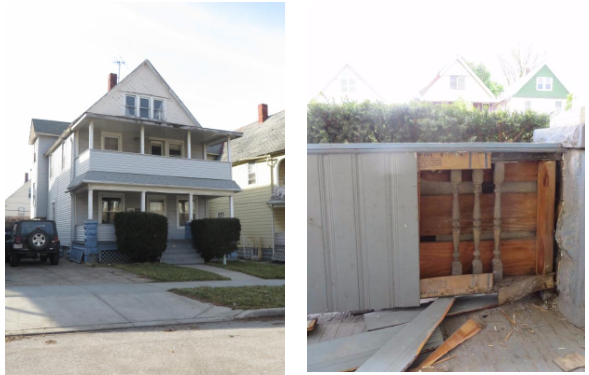 Part of our preservation approach is to help homeowners uncover hidden architectural elements and figure out how to restore them. We do this through sourcing historic photographs and supplying the owner with examples of common architectural elements based on the style of the home. Often, no guess work is needed, as the details remain, only hidden. The image above shows the original spindles that still exist under the porch siding. Even if a few spindles are missing, we can direct the homeowner to a resource that can duplicate the element and the homeowner can proceed with the restoration. 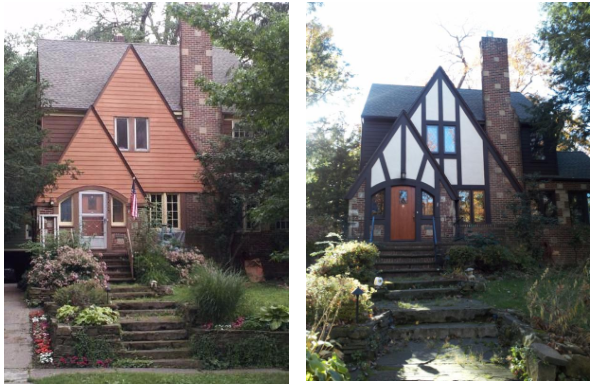 Below is a Tudor Revival that uncovered the defining hallmark of its architectural style, the stucco and half-timbering. Once the siding was removed, all the homeowner had to do was patch and paint as the original building material was intact!